Kim Kardashian and Kanye West's daughter North West peed on her dad while they were shooting the prestigious cover of Vogue magazine. 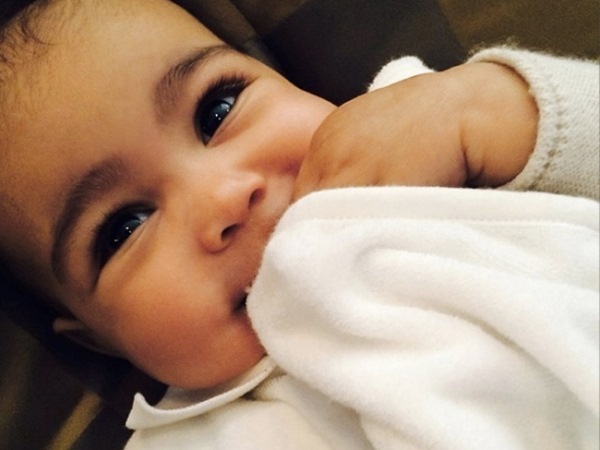 Kanye West's daughter peed on him during his Vogue cover shoot with Kim Kardashian. The 33-year-old reality TV star, who is "honoured" to grace the cover of the fashion bible's April issue, has revealed the couple's big moment was left somewhat sullied by their nine-month-old tot North West after she urinated on her rapper dad while taking a family picture for the magazine. Discussing a close-up shot of the family lying on a couch, Kim told Late Night with Seth Meyers last "North peed on Kanye in that shot. He was trying to tell me. I had to get up and clean him off." Kim - who has longed to appear on the cover of Vogue for many years - also explained how she kept the photoshoot top secret from all of her friends and family, including her sisters Kourtney (34), and Khloe (29). She said: "They were a little suspicious. My mum [Kris Jenner] knew because we used part of her house, but I told them it was something for Kanye. I don't keep the best secrets." Kim appears in a gorgeous wedding gown on the cover, while Kanye (36), is pictured lovingly caressing her from behind. The reality star gushed over the history-making cover, adding: "I knew it was happening, of course, but I didn't know it would be the cover. I'm just so honoured. Kanye's the first rapper, I'm the first reality star, [and] we're the first interracial couple [to land the cover]." I'm a 46 year old woman looking to meet men between the ages of 47 and 49.